Ultima VII Part Two: Serpent Isle followed on from the unresolved ending of Ultima VII: The Black Gate and brought closure to the Avatar's adventures there. In this second act the Avatar is informed that the villainous Batlin has gone to the Serpent Isle, where the Guardian is going to make another attempt to enter the world. The Avatar and his friends sail after them, between the mysterious Serpent Pillars and into a new land. 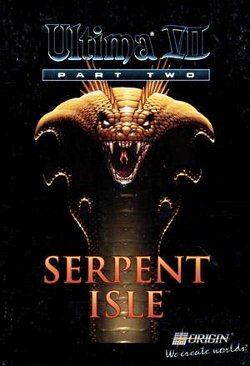 An entirely new game world filled with new monsters and items, improved graphics and controls, and a carefully woven single plot made Serpent Isle a worthy successor to The Black Gate, and the prerendered closing cinematic led seamlessly into the events and graphics of the then-upcoming Ultima VIII: Pagan. Its success led to it being quickly followed by the second Ultima VII expansion disk The Silver Seed, which added an extra plot strand, tying into the ending events to make them more positive. The missions the Avatar was sent on, though diverse and difficult, would reward him with many new and powerful items. Ultima VII: Serpent Isle - Bootstrike.com - various walkthroughs, screenshots, developer interviews, and other interesting things. These take alternate routes through the game; it is recommended to play the game normally first as these are full of spoilers and hard to follow without some familiarity with the way things were meant to happen. This page was last edited on 30 May 2016, at 14:42.